Coca-Cola Polar Bears Magnetic S&P Shakers | Coca-Cola Figurines | One Price Low Flat Shipping! 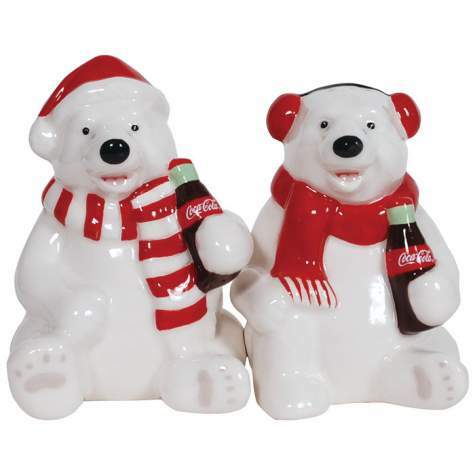 From Westland Giftware's Classic Coca-Cola Collection, Coca-Cola Chirstmas Polar Bear Salt & Pepper Shaker Set. Made of ceramic. Measures 3.25" tall. This set of Christmas Coca-Cola polar bear salt and pepper shakers features each holding a bottle of classic Coke. A perfect gift for any Coke collector! A strong magnet connects the two pieces. Dishwasher safe.